Written and Directed by Taran Killam. Starring Arnold Schwarzenegger, Cobie Smulders, Allison Tolman, Hannah Simone, Taran Killam, Bobby Moynihan, Ryan Gaul, Amir Talai, and Aaron Yoo. A team of professional assassins plan to take down the greatest contract killer on record. Every moment is captured by a documentary crew as their world begins to unravel and Gunther proves why he is still the best. Killing Gunther is what happens when you believe great characters can exist in a film without story. 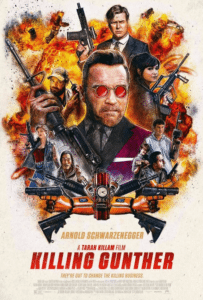 Marketed as a Schwarzenegger hitman comedy this mishmash of barely coherent vignettes are mainly the responsibility of writer, director and star Taran Killam. Killing Gunther is painful to sit through and spellbinding in its levels of ineptitude. Smulders and Schwarzenegger are wasted and thankfully only cameo, while Hannah Simone’s Sanaa barely comes out in one piece. A meandering structure held together by painful dialogue and an earnest delivery, make this hour and thirty minutes seem interminable. Disjointed, underdeveloped and improvised without any sense of control Killing Gunther fails to engage at all. Schwarzenegger and Smulders may have felt this had merit but Killam’s direction, writing and central performance undermine any good work going on elsewhere. Obviously meant as a call back to his action hero roots Schwarzenegger is trying too hard with substandard material and it shows. That Killam chose handheld and steady cam for the duration of Killing Gunther makes things feel more distracting, less engaging and creates further separation. This Saturday Night Live effort lacks the charm and self-effacing quality of Wayne’s World that knew its era, embraced the characters and kept the scope sensible. What Gunther does is play on a broader canvas when the characters are too thinly sketched and Killam’s central idea woefully transparent. Few films have the potential to leave you angry but Killing Gunther is one such example. Schwarzenegger and Smulders stick out like sore thumbs, primarily because their characters are the most developed. They do more in the minimal screen time they have than anyone else barring Hannah Simone. 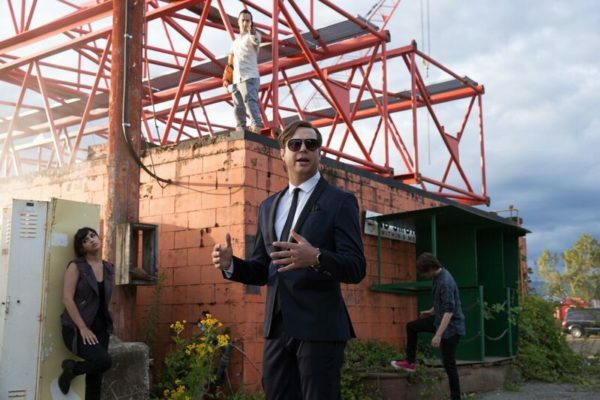 Killam’s Blake is essentially unlikeable and devoid of redeeming features being both pompous, overbearing and vain. His cavorting characterisation makes him annoying and since Killam wrote the script you would think quotable lines would be peppered throughout but unfortunately not. Killing Gunther belongs in a bargain bin and is a stark reminder that money and a movie star are no guarantee of success. Killing Gunther will be available to watch on Digital Download from 2nd April and can be bought here.